Hello friends, TGIF, one more day before the weekend! Hope you are keeping warm if you are in the areas that are getting cold and snow. I made this card for my sister for Valentines Day. She lost her two year old standard poodle Vinny in November, very suddenly. She believes the dog was poisoned. The poor dog died a horrific death and it was so sad. 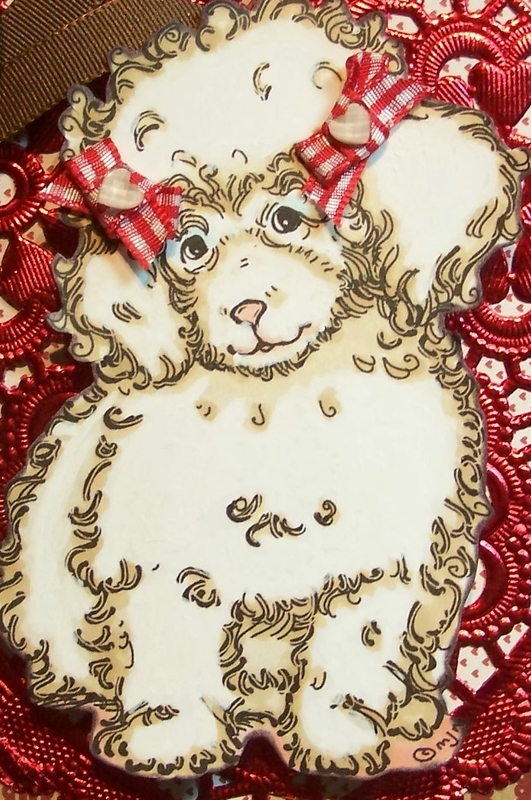 Her husband surprised her with a poodle pup for Christmas, just eight weeks old, so when I saw this Mo's image, I just had make a card for her. I'm entering this card into the Challenge at Mo's Digital Challenge #170 Lace and Ribbon. Awww that image is so cute and I love the beautiful colours and pretty doily. I am sure your sister will be thrilled to receive such a special card. I was sorry to hear about what happpened to her dog, it must have been heart-breaking. 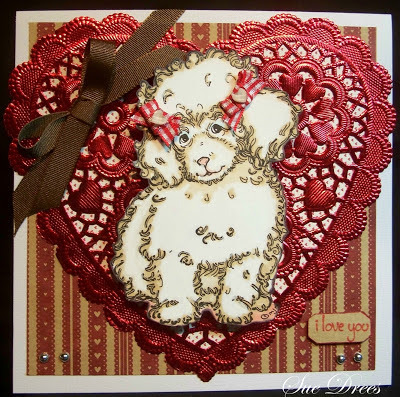 this is so sweet Sue such a beautiful card. Fabulous image and that red heart doily is amazing, what a wonderful card to give your sister! You sure colored this little poodle to perfection. 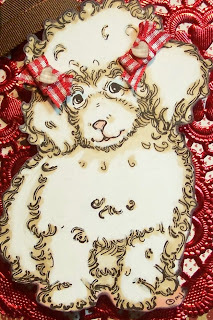 I know this little poodle puppy will bring a warm spot to your sister's heart. Is it a standard poodle too? This is a "bone-a-fied" beauty! She will love it! This little pup is as cute as can be. Love your layout and pretty heart! Mo's puppies are the cutest, aren't they? Absolutely beautiful card. I am so glad you joined us at Mo's Digital Pencil this week.